This inspiration is coming straight at you from Dr. Douglas N Graham’s book, 80/10/10: Balancing Your Health, Your Weight, and Your Life. While I do have plans on reading this book – so far, I’ve just skipped to the suggested meal plans. That’s where the fun is at. 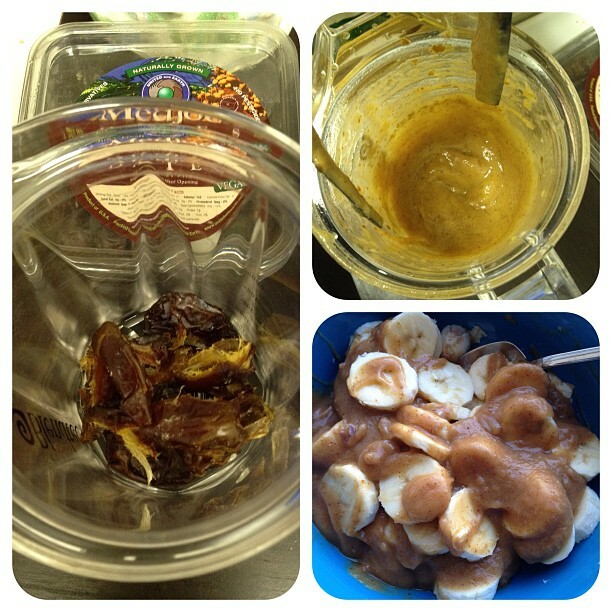 This breakie is composed of 2 1/2 bananas and about 8 dates blended with 3/4 cup of water. The date sauce reminded me of a caramel sauce, similar in color and taste. Even though I’ve made date paste quite a few times, I’ve never just sat down and destroyed a bowl of it before. My consensus? As a person who likes desserts on occasion and one who usually craves salty things; I found this almost too sweet for my tastes. It was good but it took me a while to finish. Still, I like trying new things. That’s why I’m here with this decadence before me. I think it would be perfect idea for a pre-workout meal. Thanks to this book, I’ve eaten a whole bunch of celery, by myself, in one sitting – twice this week. The first celery outing was with a whopping 8 medjool dates (I don’t think I’ve ever eaten that many dates in one sitting – energizing for sure). The second, I made this little creation. I called it my celery raft. The celery is filled with various yums: basil-spinach pesto, homemade raw almond butter, homemade almond cheese, and sliced dates. It was so good. The 80/10/10 meal plan reminds me a lot of my early raw days, except I definitely wasn’t eating that much food in one sitting. More the idea of getting the bulk of your diet from fresh fruits and vegetables – without the gourmet raw. What do you crave, salty or sweet? Have you read 80/10/10 concept before? Sadly, I crave chocolate, albeit dark chocolate. I try to combine it with almonds. While I have worked hard saving chocolate for an occasional treat from my former “addiction” level, I do savor the dark chocolate-almond treats maybe twice a week. For me, it sometimes comes down to the ease of grabbing the 85% cocoa bar and about 10 raw almonds instead of actually preparing a sweet treat.